Running in the background somewhat off by himself in The Fox Chase, the painter William Robinson appears determined and intrepid, Yankee characteristics that are true to his nature. Born in East Gloucester, north of Boston in Massachusetts, young William was the son of a fisherman whose early years were highlighted by meeting the famous artist Winslow Homer and famous writer Rudyard Kipling. Robinson stayed in the boardinghouse off and on from 1905-1920, but moved in full time beginning in 1921 until Miss Florence died in 1937. 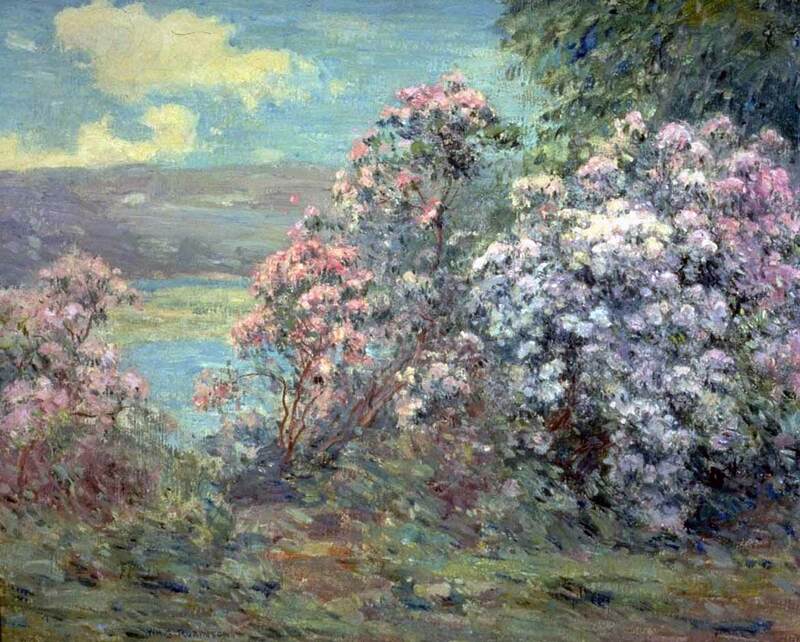 He was one of the first members of the Lyme Art Association, and eventually was their president. Robinson had a long-term studio on the property very near the brook that ran between the boardinghouse and the Lyme Art Association. 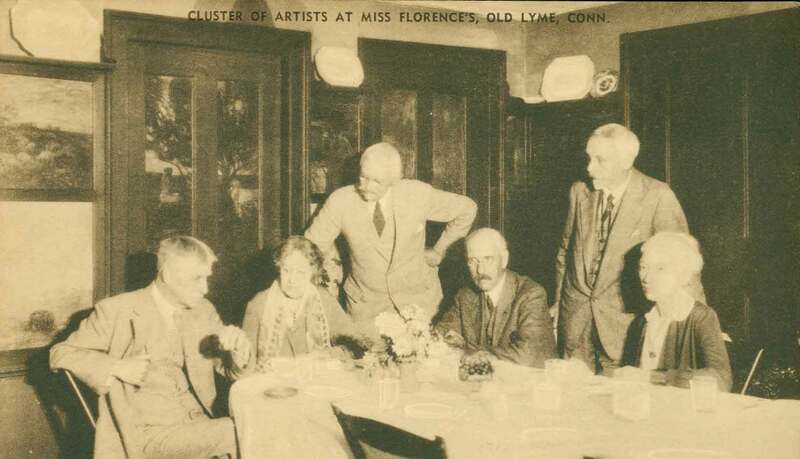 From left to right: Bruce Crane, Florence Griswold, Henry Rankin Poore, William Robinson, Ernest Albert, and Lydia Longacre. 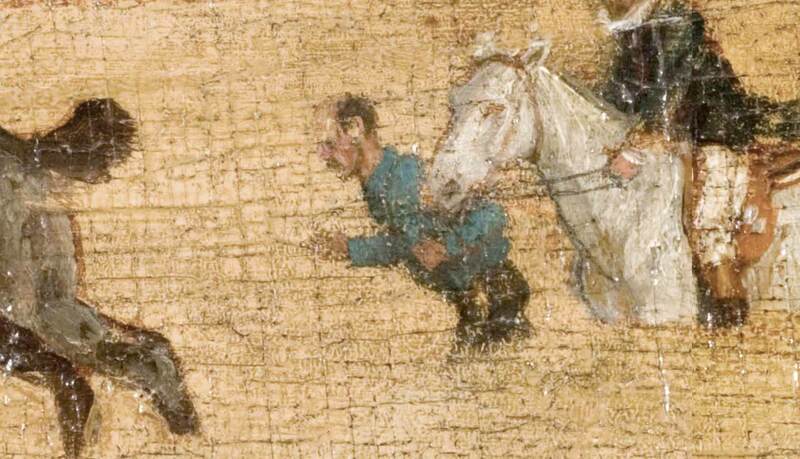 His early art work focused on the sea, with paintings and drawings of boats. Around 1890, he traveled to Paris to study at the Académie Julian. Upon his return to the United States, he began to exhibit his art and teach in both Philadelphia and New York. In 1905, Robinson traveled from New York to Old Lyme to stay at the boardinghouse of Florence Griswold. He worked in a studio near the brook that flows in the corner of the property. In 1921, Robinson moved into the boardinghouse and established a full-time studio on the grounds. During this same year, the new building for the Lyme Art Association, designed by Charles Platt, opened, and Robinson became a charter member—years later he was elected their president. Once sequestered in Old Lyme, his paintings revel in the surrounding landscape. Robinson was one of the few people with Miss Florence when she died in the house in 1937. Shortly thereafter, the boardinghouse was shut down and all of her belongings sold in a public auction on the front lawn of the house. 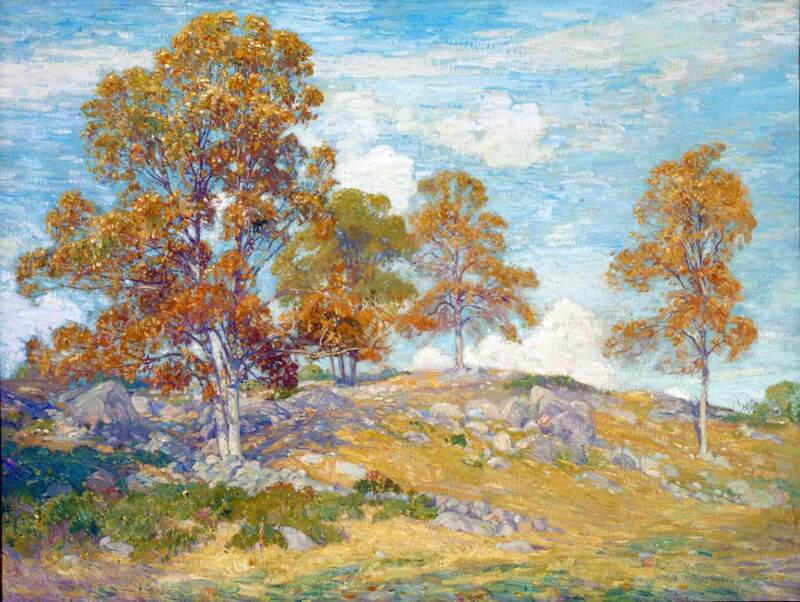 Robinson then moved to Biloxi, Mississippi, where he continued to create impressionistic landscapes. Instead of stoic New England homesteads and blossoming mountain laurel, however, he painted charming images of shrimp factories and southern shanties. William Robinson to us all was first and last a painter. He had few hobbies and did not seem to need any. 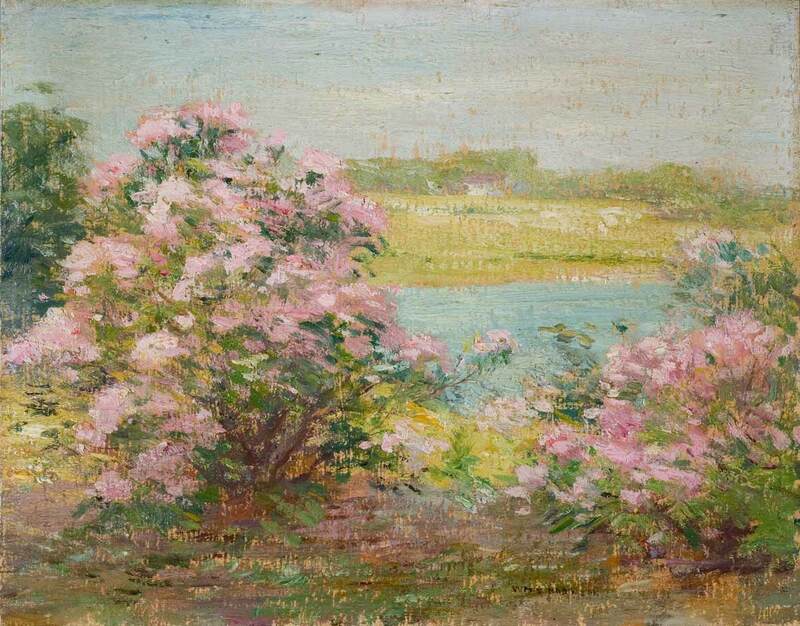 He painted the beauty of the New England countryside, its harbors and vessels with devotion and knowledge accumulated through long years of study and acquaintance. 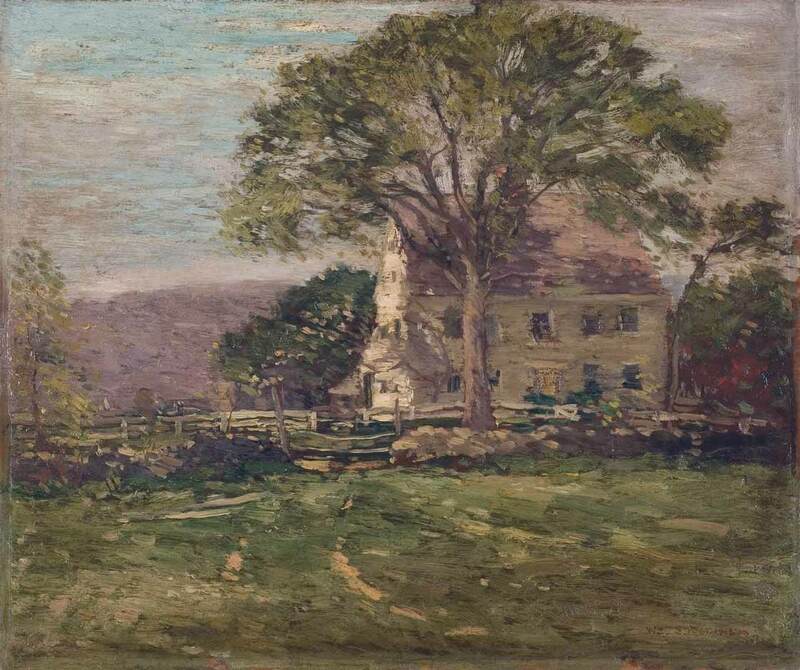 His best pictures are not always of sailing vessels but more often of Connecticut hillsides and pasture lands, especially about Old Lyme where he lived for thirty-one years in the old Griswold House, working in a studio across the brook from the Lyme Art Association Gallery.